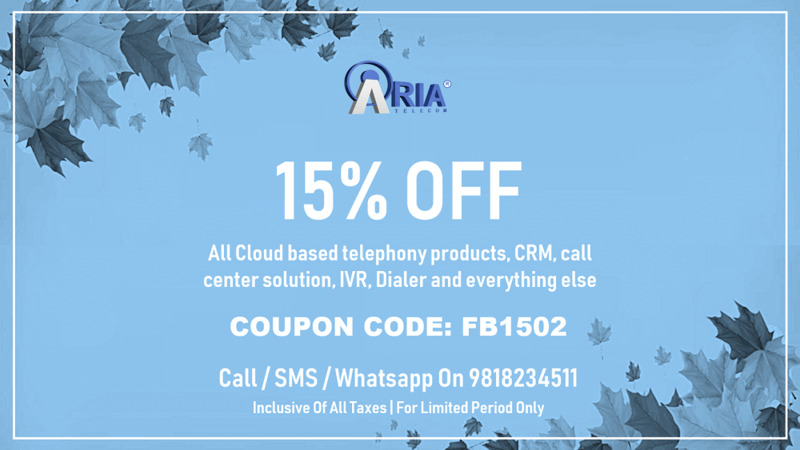 Aria Telecom is celebrating the 15th anniversary and on this occasion, we have released an attractive offer on Predictive Dialers. Now predictive dialer is available at the cheapest rate with us in India. We are offering a flat 15% off on all predictive dialer prices including taxes. This amazing prize drop has been announced to celebrate the joy of completing 15 successful years with our beloved customers. Now you can get predictive dialer for your office at an unbelievable starting price of 35,000 INR. This minimum priced dialer is for 5 seating arrangement and we ensure 100% successful installation from our side. The prices for other seater arrangements and improved versions are priced as per technological standards and comes under the 15% discounted price umbrella. Other than, predictive dialer, we are also holding the same 15% offer on our all other products including call center, voice logger, GSM gateway, cloud telephony services and others. All aria telecom products regardless of level are priced with 15% discounted rate in this occasion of our 15th-anniversary celebration. On this occasion, Founder Mr. Ravindra Saini has added “we now offer over 50 telecom service products in out different lines and planning to add more in upcoming future. We have entered the cloud and app-based communication technology this year with the help of our hard-working team. We have also planned for introducing new features into our product lines in the upcoming year which will revolutionize the industry standard”.